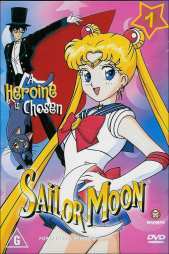 This disc introduces the incredibly addictive series Sailor Moon and the heroine of the series, the 14 year old Serena who is having troubles in school, let alone staying awake! Whilst not pushing any new boundaries there is something incredibly catchy about Sailor Moon, right from the title song through to the wonderful backgrounds used in the cartoon. The backgrounds are all these wonderful watercolour pictures that are used to great effect. Also the animated art is also coloured in the same method. It's eye catching and even though I have seen it done before, it looks particularly good in this series. There are six complete episodes on this disc and the characters are lively and have a real character about them as opposed to generic shallow characters that abound in some anime. The villains, headed up by Queen Beryl (great name), are amusing and worthy opponents to the different Sailors from various planets who must join forces to combat evil. The disc is well presented and looks and sounds good. Whilst utilising Dolby Digital it is only 2.0 so don't be expecting any activity from your rear speakers. The disc didn't lose anything with the exclusion of this sound option. Sailor Moon Volume 1 is a great way to get into the sensation of this series! Highly recommended for people who like a great fun anime DVD.